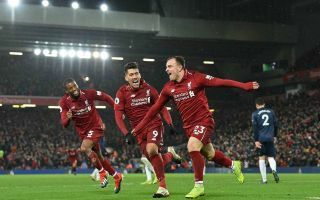 Liverpool star Xherdan Shaqiri has sent a rallying cry to his team-mates ahead of today’s big game against Manchester United. The Switzerland international notably scored twice against the Red Devils in their last meeting at Anfield back in December, and posted a photo of himself celebrating one of his goals in that game. Shaqiri will no doubt hope to be the hero again today in what will be an even bigger game for the Reds and their title challenge. Shaqiri’s brace against United earlier this season was enough to see Jose Mourinho finally lose his job, but the team has improved hugely since then, with Ole Gunnar Solskjaer coming in and doing a great job as interim manager.